Table Mountain has very ancient origins and lies on top of even more ancient bedrock. Around 560 to 540 million years ago, this area was a sea on the edge of an ancient continent. The mud and muddy sands that were deposited on the bed of that ancient sea are today the rocks that lie under Cape Town. They are known as the Malmesbury shales. Movement of the continents 540 million years ago forced huge blobs of molten rock from deep inside the Earth’s crust (magma) up into the Malmesbury shales. The magma cooled and crystallised to form the Cape granite. 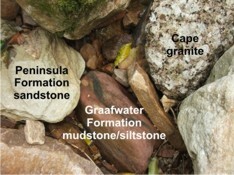 Granite underlies Kirstenbosch and the southern Peninsula, while Malmesbury rocks underlie the CBD, Cape Flats and the Swartland. The continents collided, pushing the Malmesbury shales and Cape granite up to the surface and exposing them so that over the next 30 to 40 million years, they were eroded into a flat plain. That plain became an inland sea and river delta. Over the next 170 million years, between 510 and 340 million years ago, the mud and sand that was washed off the ancient continent was deposited on top of the Malmesbury rocks and granite. As the plain sunk, the mud and sand were buried, compressed and cemented to form nearly horizontal layers of shale and sandstone. 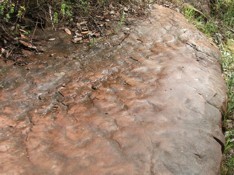 More and more sand was deposited until the sandstone was 7 km thick. These rocks are known as the Cape Supergroup. Table Mountain is made up of the bottom layers of the Cape Supergroup. Between 280 and 235 million years ago the collisions between the continents that created Pangaea, caused the 7 km thick sandstone rocks to be folded, compressed and crumpled up while it was also lifted up to form a massive mountain chain, the Cape Fold Belt Mountains. The mountains we see today are just the remnants of a mountain chain that once must have been as mighty as the Rockies. In fact the mountains that remain are the troughs, or low points, of this ancient mountain chain. For the last 400 million years, they have been eroding away, the sand washing into the sea to form the rocks of the future. Pangaea started to break apart 180 million years ago. It was this event that caused the massive outpouring of lava that created the Drakensberg Mountains. In Cape Town a number of 130 million year old dolerite dykes mark the event. They are pillars of black rock that slice through the bedrock Malmesbury rocks and Cape granite, and the sandstone. At Kirstenbosch, a dolerite dyke crops out on the 300 m contour path just north of the Nursery Ravine path. It is difficult to spot because the distinctive black rock has weathered brown, making it look just like the other rocks.